The Pantanal is a unique wetland paradise that boasts overwhelming biodiversity and natural beauty. With a population in the millions, caimans are one of the most numerous animals in this area. One night we came across this caiman lying in a small stream, waiting for fish to swim past its jaws. It was a wonderfully clear night so we decided to take a long exposure that would show the stars moving through the sky above. 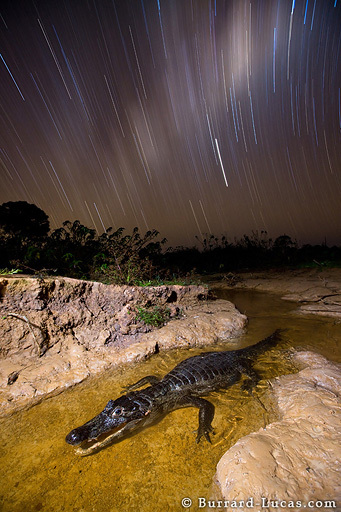 The star trails add a timeless sense to this image of a prehistoric predator.